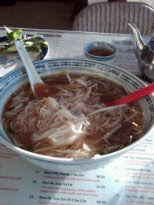 Nice hot and yummy Vietnamese noodle soup on a cold freezing my hoohoo day! Stopped over at the Vietnamese restaurant in Winooski after photographing the Marci Gas parade in downtown Burlington. It was freaking coooooold!